Mimosa, wild chamomile, and night-blooming jasmine hover as blossoms over leafy, earthy notes of vetiver and oak moss. Orchard is a full essence for both men and women. Additional notes include clary sage and ambergris. 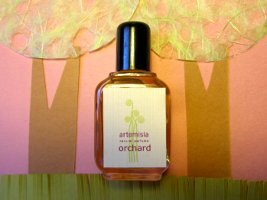 Artemisia Natural Perfume Orchard is available in 7 gr Solid Perfume ($26) and 17 ml Eau de Parfum ($86). Samples are also available. Orchard is really very nice – I tried it when it was a submission for the Midsummer Night’s Dream blogging project. It smells like taking a walk outdoors on a warm summer night. The chamomile is especially pleasing.